When I found out Stuart Weitzman was releasing a special shoe to celebrate their 25 years I was excited. 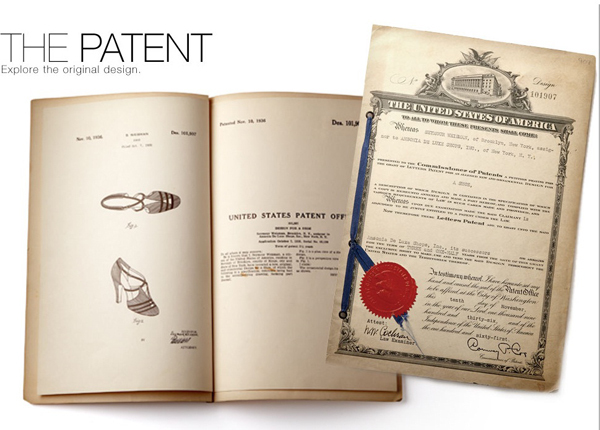 When I found out that shoe was from an old patent his father designed in 1936 I was ecstatic and curious! Then I got a look at said shoe and I was in complete awe. The shoe is gorgeous, absolutely gorgeous. Stuart's father, Seymour Weitzman, designed/patent this shoe in the 1930's-leather with a double-crisscross T-strap stiletto. Sadly the proposal didn't quite go over so well. Flash forward three quarters of a century later the brand stumbled across Seymour's patent and produced the long-lost shoe, naming it "The Heritage" and made a few changes. A platform, higher heel, and snake print were added to bring this shoe into the 21st Century. I have a secret. I caved in and I bought these! Shocked? No, I didn't think so. My hardest decision with buying these was what color to choose. I'm not going to tell you till they come, but can you guess what color I snagged? As always at the bottom I was in no way paid for this post by the shoe company but damn I wish Stuart Weitzman did partner up with bloggers. I'd be beating girls down to be first in line! I am in no way paid by any of these shoe companies to feature them on my blog. I am simply just voicing my opinion and sharing with you, my reader, something I love and find interesting. I'm gonna guess you got the blue???? Love all of them, u cant go wrong!! Those are some serious stems! I'm digging the red ones!